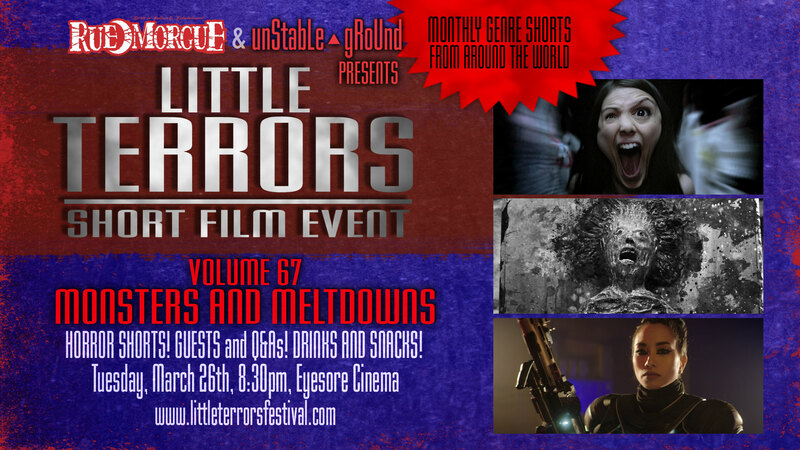 Our long-running short film festival LITTLE TERRORS returns this month, on Tuesday, March 26th! The line-up includes nine diverse genre shorts, including work from the prolific Izzy Lee, twisted local stop-motion animator Adam Ciolfi, and the intensely-disturbing French short ACIDE, where the rain literally makes people melt. LT-alunus Lee (My Monster) returns with this…. I can’t even describe this. Just watch it. A young girl doesn’t come back alone after being lost in the woods. A young boy lives in fear of something in his basement. LT-alumus Ciolfi (Broken) returns with this stylish stop-motion tale of gritty noir-tinged revenge. After every storm a child has gone missing. It’s raining again. From LT-alumnus director Verot (Echoes in the Ice). Previous selection of Toronto After Dark. A strange Romanian trying to enter Canada is confronted by overzealous customs officers. Funny genre tale! In the near future, two VR gamesters meet unreal life and expose their dark interactions in game. Previous selection of Toronto After Dark. On her way home from work, a young woman’s life takes a terrifying turn. Tuesday, March 26th, 8:30pm, Eyesore Cinema. Get your tickets here. And don’t forget our Little Terrors anthology trilogy, available at the Rue Morgue Shop.